With terribly hot and humid spring and summers, it is no surprise that there are a lot of options for swimming in Hong Kong. There’s the apartment buildings – many of the newer ones have pools. Hotels also have pools, you can basically take your pick of where you want to go. 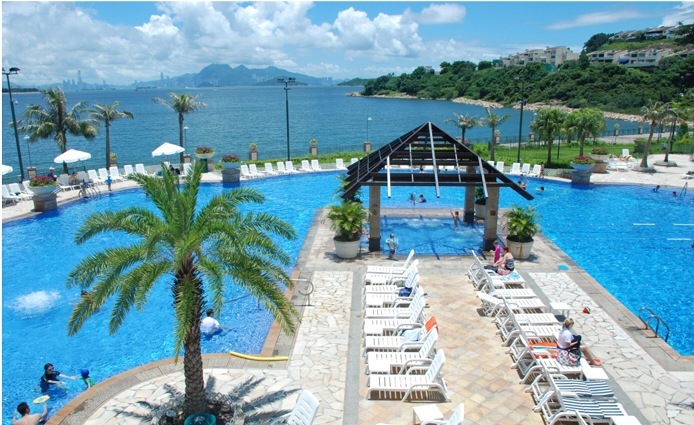 There’s also a lot of public pools – for example in Kowloon and Tung Chung they are inexpensive and nice, and definitely a good option. In Discovery Bay, where we live, there are 2 pool options, at both the “clubs.” You have to pay a monthly fee to access these clubs, and when you do you get pool access, and a few other amenities like play rooms and discounted prices in their restaurants (although you still have to pay for the gym an additional fee, so it’s not that awesome).